Down by the river, the first to go missing were not much lamented. Disappearances of homeless men foraging through trash or nuisance skater kids who rolled their boards along the planked piers at night were not noteworthy enough to delay the city's development projects. But deep beneath the riverbank, the evidence of a terrible crime has been covered up twice. When a TVA dam falters and the river swells, panic rises downtown. As the Tennessee creeps over its banks, it dredges up death from its own polluted bed. Twenty-nine victims of a long-ago slaughter walk when the water rises, patrolling the banks and dragging the living down to a muddy grave. No one remembers how they died and no one knows what they want. Some secrets are never washed away. Instead they are patient, biding their time. They wait for the water to lift them so they can prowl for the justice that was denied them ninety years ago. But in ninety years a city's shape changes, and where justice can no longer be found, vengeance may have to suffice. The city of Chattanooga is about to learn a terrible truth about the things a river can and cannot hide…. And reluctant medium Eden Moore may be the only one who can dissuade the twenty- nine bodies from adding hundreds of its citizens to their ghastly ranks. 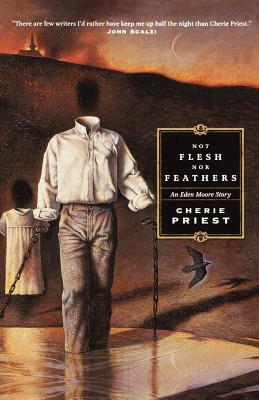 Not Flesh Nor Feathers is a stand-alone sequel to Four and Twenty Blackbirds and Wings to the Kingdom.